Ross & Cromarty Roots | Lochbroom Parish Church, Clachan. The Church of Scotland parish church of Lochbroom sits on flat bottom land of Strath More at Clachan close to the head of Loch Broom. The scenic location, next to a sheep farm, appears isolated as it is almost 10 miles from the parish's main centre of population at Ullapool. However, it is about the central point of a huge parish, and Clachan in the past would have had more inhabitants than it does today. The area has ancient christian associations. The existing church, the first Presbyterian church built in the parish, replaced an earlier one in 1816-17. Most of the visible stones are in good condition. The earliest recorded death inscription is dated 1724. Mackenzie names predominate amongst the older inscriptions. (The Clachan Burial ground is a modern extension of the churchyard, but is included under Lochbroom Parish Churchyard in this image library). Photograph of former manse see Link below the Comments. Picture Added on 03 April 2008. 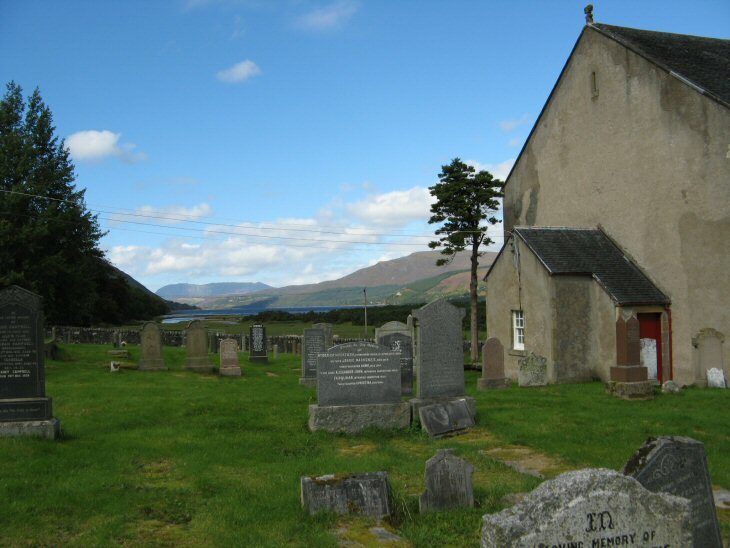 My ancestors - McLeans and Camerons - were christened in Lochbroom Parish and probably in the Church pictured. I have visited Ullapool and the area and certainly wish I had visited this lovely old Church. Thank you for the beautiful scene. Added by Marilyn Cameron Stinson on 22 July 2009. My great great grandfather was Rev. William Cameron. He was the minister at this church for over 50 years! He and his wife, Isabella raised their family in the manse. This wonderful website has enabled me to be in touch with an entire branch of the family of which I was previously unaware! Added by Lorraine Cameron on 23 November 2009. My ancestor was the Rev. John MacMillan, he was the Minister of Lochbroom 1872-1905. I wonder if this would have been his church? I have still yet to find where he is buried, and his mother, Mary (Todd) MacMillan. They lived in the church manse in Ullapool, but don't know where that is. If anyone has photos or information about the burial locations, the church or the manse, it would be very much appreciated. Added by Gary S.A. Haslam on 24 November 2009. Hello Gary. The Church at Clachan is the original site of the the Church of Scotland Parish Church. The manse(now a private house)is directly behind the church. The Church of Scotland's Church in West Argyle Street, Ullapool, was built in 1829 (image 1501). I think I've got a pic. of the former Clachan manse and will look it out. Email me if you need anything further. Added by Roddie on 24 November 2009. Gary, had a quick look at the history books. John MacMillan was prominent minister of the Free Church. His church would have been in Ullapool. He was a thorn in the side of landowners, particularly at Leckmelm. If you contact the Free Church of Scotland, they should be able to give you chapter & verse, and the whereabouts of his grave. Added by Roddie on 25 November 2009. Visited Lochbroom area in 2007 looking for ancestor surnames Ross and McKenzie who lived in the area - Ardcharnich, Loggie, Blarnalearoch in the 1854 - 1867. Passed by the churchyard on our way along the west side of the Loch. Your picture reminds me of the beauty of the area. Would this have been called ChurchYard of Lochbroom in death notices during those times? We took many photos! Hope to return. Added by Ron Ross on 25 November 2009. Ron, as it was the site of the Parish Church of Lochbroom, I believe that this would be the "Churchyard of Lochbroom" in official notices. I hope you do return! Added by Roddie on 26 November 2009. My great grandfather and g. grandmother are buried there. Donald and Isabella Mackenzie, also their daughter Ann. My grandfather William migrated to South Africa. I wonder if there are any of this family left in the area. Added by Donald Mackenzie on 11 January 2011. Hi Don, it seems a lot of families moved to South Africa, including my MacMillan ancestors (the family of Rev. John MacMillan, he was the Minister of Lochbroom 1872-1905). I wonder why all of a sudden so many up and left their native Scotland? Added by Gary S. A. Haslam on 17 January 2011. It is a fine view looking beyond the loch and Ullapool to Ben Mor Coigach. My parents and many of my maternal ancestors have been laid to rest there since the late 1700s that I can identify. It is possible that they were buried there for several hundred years prior to that time as Munros are recorded as being in Inverlael as early as the 1400s. Added by Norris Munro Spence on 11 March 2012. Added by John W Watt on 10 February 2016. John Watt: your g.g.father was a younger brother of my g.g.father Murdo. I know Ardcharnich very well and the people who have lived there since the 1930s. There are few people left although I still have a cousin living there. I try and visit every year. Added by Norris Munro Spence on 11 February 2016. Murdoch MacLean born 1793 Inverlael Loch Broom and Jannet MacKenzie born 1794 Leckmelm Loch Broom married May 11/1818 at Loch Broom .... this info on the marriage comes from the Lochbroom Marriage Register. Would anyone have information on these people? They are my 3X great grand parents. They came to Nova Scotia circa 1820 and brought up a large family ... they are buried in West Branch River John. Jannet's headstone states "from Lochbroom". Thank you for your time and interest. Added by Rowyn MacLean on 23 May 2016. In the 1820s Inverlael Estate was cleared of the tenants to make way for sheep. Some of the tenants were relocated onto designated croft lands but many of them immigrated. This way be your relative. Added by Norris Munro Spence on 27 May 2016. Rowyn MacLean: I came across this article that may pertain to your family . The Riverdale MacLeans- Many of the MacLeans to settle in western regions of Pictou county were from the Parish of Lochbroom in Wester Ross. The MacLeans as a clan, were centred around the isle of Mull and the Southern Isles. In the early 1400's, the Lord of the Isles conquered several of the Earldom of Ross. To keep tabs on his new territory he planted several clansmen and vassells throughout the region. As part of the planting, the MacLeans were placed within the Parish of Lochbroom.This particular MacLean family lived on the southern shore of Lochbroom near the old Parish church at Clackan. Eventually the MacKenzies took over the area and they became, out of necessity, loyal to that family. The earliest know ancestor of this line is John MacLean who married Nancy MacKenzie. They were married in the early 1780's . John and Nancy remained in their native home while their sons and daughters drifted off to Nova Scotia. After Nancy died, John came to Nova Scotia as an elderly man to live with his sons at West River Station. He took as his second wife, Christy Urquhart, a native of Scotland who came with her family to Salt Springs area. Of John and Nancy's family, Murdoch, John and Rod took up land at West River Station, Pictou. Alexander and Kenneth came to Nova Scotia in 1818 and obtained land in what is now known as Riversdale. They brought with them a letter of good character by their parish minister. Children of John MacLean and Nancy MacKenzie: Roderick K McLean 1820-1891, Murdoch McLean- 1822-1914, John Kenneth McLean - 1826-1890, Nancy McLean- 1828-1890, Mary McLean- 1831-1919, Alexander McLean-1835-1918, Catherine McLean- 1837, Kenneth R McLean 1840-1919. The source of some of this information is Glen Matheson's Earltown Roots..website no longer exists. Added by Nancy McLean on 05 September 2016. John Mclean born around 1750 Lochbroom Death Feb 28 1827 West River Station Nova Scotia He married Nancy MacKenzie born about 1760. They were married in the early 1780's. Children: Murdoch McLean (1782-1852), Margaret McLean (1784-), Alexander McLean (1787-1873) John Kenneth McLean (1791-1862), Kenneth McLean (1793-1879), Nancy McLean (1793-1879), Roderick McLean (1800-1887)John and Nancy remained in Scotland while their sons and daughters went to Nova Scotia. Murdoch, John and Rod took up land at West River Station, Nova Scotia. Alexander and Kenneth came to Nova Scotia in 1818 and obtained land in what is now Riversdale. They brought with them a letter of good character signed by their parish minister. After Nancy died, John came to Nova Scotia as an elderly man and lived with his sons in West River Station. Added by Nancy McLean on 06 September 2016. To make a correction to my first post the names l listed as being the children of John and Nancy are those of Kenneth McLean , their son . Kenneth was born Nov 1792 in Lochbroom. He came to Nova Scotia in 1818, and in 1819 married Mary Keith Innis ( born Lochbroom 1802). Kenneth and Mary would be my great, great grandparents . John born 1782? married 18-12-1817, Deceased by 1857, 1841 residence listed as, Lochbroom, Ross and Cromarty, and Betsy/Betty McKenzie born 1796 in the same area. They had a son Joseph Campbell born 1832 he married Isabella Ross in 1857 in Logie Easter. Joseph was a shepherd at the time of his marriage. Isabella's parents were Arthur Ross and Isabella whose surname I haven't yet established - it is on the register I have but undecipherable. I am hoping to come to the area later this year and would like to establish where they are likely to be buried. My paternal grandmother was a Campbell. My daughter is currently studying at Edinburgh university. Added by Bronwen Summers on 11 April 2017. Hi, would anybody know of the Mcleans and Camerons that came to NewZealand?, they left in 1860 and settled in the far south of the south Island of NZ. Both families came from Ullapool. There was John and Mary Mclean and Mary's father John Cameron, his wife and two sons. Added by Nicci Spencer on 18 April 2017. Added by Heather fraser nee stewart on 21 May 2018. So beautiful and peaceful. Was there about a month ago witb my dad. Murdoch 'Dodo' Munro was my grandfather, with my grandmother Isabella. I believe Alexander Munro, and others of my family buried there too. I would love to know if anyone has information about the house in Ardcharnich called Balnoster. Thanks! Added by Erika Nygard on 03 September 2018.